Super friendly staff but interior is just a bit out dated and old so such a great location. 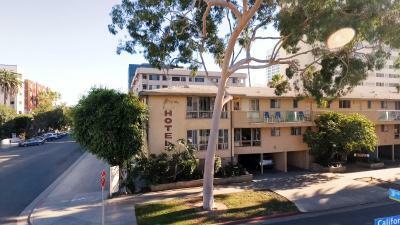 The price was very good for the location, though no sea view or anything, but very close to the beach and Santa Monica pier. The apartment building is an older type, but I prefer to book apartment type of accommodations to have kitchen for example as we like to cook, plus it usually has more space. So in this case it was not a modern type of the apartment, but it was nice enough to enjoy our short stay. Great and convenient location, large suite. Options for parking include cheaper city lots. The pool is truly heated well, my son went swimming on a cold night. One bedroom apartment with full kitchen. Very spacious even if a little dated. Great location and great value for the money! Close to the ocean and downtown Santa Monica. Plenty of restaurants close by. I love the pool location. It's private and away from the wind. The living rooms and kitchen area are huge for the cost of the place. The staff is always willing and able to help, friendly, and just fantastic in every way! The suite was obviously an apartment in its previous life, so it's quite spacious. It was quiet, located in a residential neighborhood. 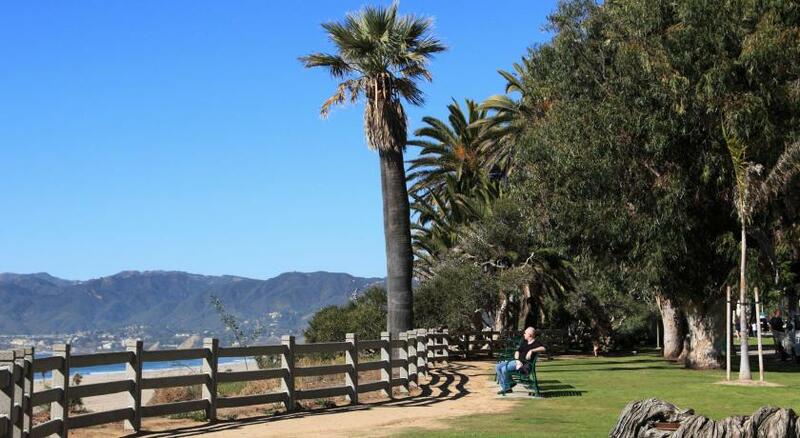 The location was great, close to the ocean as well as the Third St. Promenade. The kitchen was well stocked with cooking and eating supplies. The staff are very warm and helpful. The location- near the promenade and close to the beach- was good. Having a kitchen was very important to us and the kitchen was perfect. Great friendly staff. Very helpful. Perfect location. Considering other properties in the area a great value. Having a kitchen is an added bonus. It is a classic 50s/60s California apartment building somewhat frozen in time. We loved the swimming pool. It’s in a great location two blocks from Ocean Boulevard and one block behind the Fairmont Hotel. You can cook you own meals and it’s like staying at a friend’s apartment or like the first place you could afford to rent as a young married couple back in the day. It’s 3-star but charming and the staff are wonderful. We enjoyed it for what it is and will most certainly return. Cal Mar Hotel Suites This rating is a reflection of how the property compares to the industry standard when it comes to price, facilities and services available. It's based on a self-evaluation by the property. Use this rating to help choose your stay! One of our top picks in Los Angeles.This ideally located all-suite hotel is a 10-minute walk from Santa Monica State Beach Park. It features an outdoor heated pool and spacious suites with a fully equipped kitchen. Accommodations at Cal Mar Hotel Suites include cable TV along with a living room with a sofa bed. The traditionally decorated suites also provide a dining area and ceiling fans. The hotel offers a tour desk. Car hires can be made at the front desk. 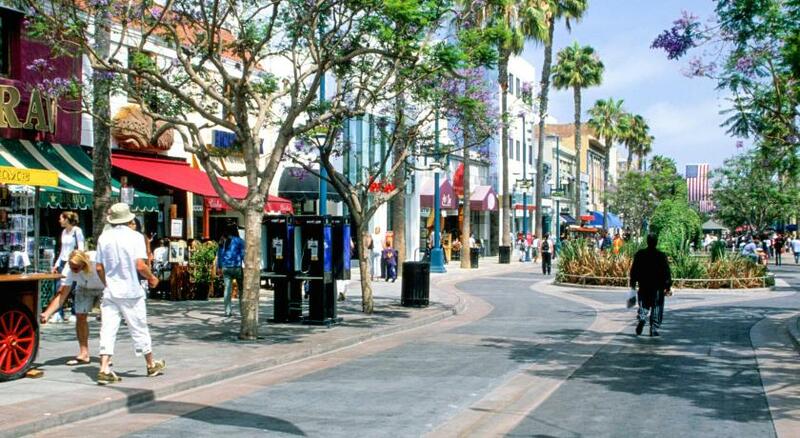 Third Street Promenade is less than a 10-minute walk from Cal Mar Suites. Los Angeles International Airport is 9.9 mi away. When would you like to stay at Cal Mar Hotel Suites? Suite offers a cable TV, a desk and a full kitchen with tea/coffee-making facilities. Private parking is available on site (reservation is not needed) and costs USD 34.10 per day. Please note that the room price is based on 2 guests. Maximum occupancy is 5 guests (see Hotel Policies). Features views of the gardens and pool. Offering a fully equipped kitchen, this suite offers a cable TV, a seating area and a work desk. 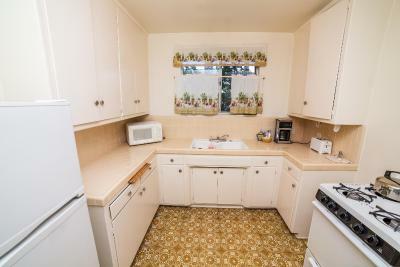 It includes a dining area and kitchenware. Room includes a sitting area with a cable TV. A desk and a full kitchen with tea/coffee-making facilities are also provided. The hotel offers a tour desk and airport shuttle services. Car rentals can be made at the front desk. Third Street Promenade is less than a 10-minute walk from Cal Mar Suites and Los Angeles International Airport is 10 miles away. House Rules Cal Mar Hotel Suites takes special requests – add in the next step! Cal Mar Hotel Suites accepts these cards and reserves the right to temporarily hold an amount prior to arrival. Early check-in may be available at a half-day rate. Rates are based on single occupancy, extra person charges are applicable. WiFi rates are applicable per device. The guest name on the reservation should match the name on the credit card used and presented upon check in. Rooms were large and comfortable. The hotel is in easy walking distance of 3rd Street Promenade (the main shopping and restaurant area) and Santa Monica beach and pier. Staff were friendly and helpful even giving us hand with our luggage. I liked everything about the hotel and it's staff which is incredibly helpful and friendly. The best location you could think of. Some of the vents were falling apart but overall great feel and accessibility to everything. The shower and need updating.though both are fit for purpose. When I booked didn't realize wud be an extra $30. Per night for parking. That's a big price difference. Entrance gave a bad impression on arrival. Great space and facilities, the staff were most kind and helpful. We considered it a hidden gem. In a great position for everything,but still quiet. The staff at the Calmar are exceptional! They cater to the customer and are extremely helpful and professional. The reception staff were particularly kind and helpful . I felt as though I was being looked after by angels! The place is very well kept, inna retro style. 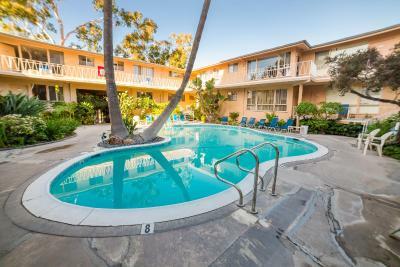 Superb location just 3 blocks from beach and all the fancy hotels - where you can eat well! New solid entry door to the room and doorframe would change the safekeeping impression a lot, I believe. Was fine - fulfilled all basic criteria and then some. Nothing luxurious, but practical and very useful. Great location!! !